Hydro Ottawa’s Distribution System Design team offers its expertise in design, costing, financial administration, and project management to builders and contractors undertaking new construction, retrofit or upgrade projects. We provide these services in a timely and cost-efficient way, ensuring that each project adheres to Ontario Energy Board (OEB) regulations, Canadian Standards Association (CSA) standards, and to Hydro Ottawa’s internal standards and Conditions of Service. 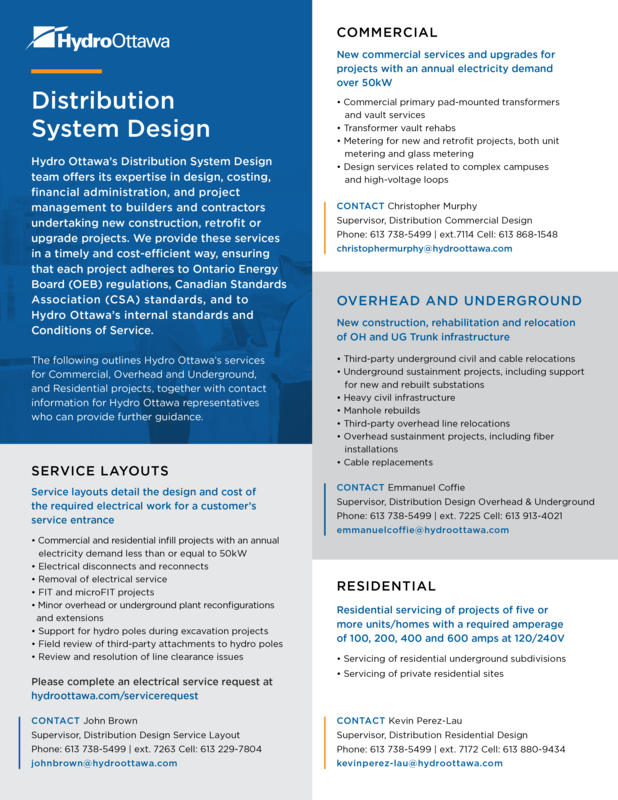 The following outlines Hydro Ottawa’s services for Commercial, Overhead and Underground, and Residential projects, together with contact information for Hydro Ottawa representatives who can provide further guidance. Customer Layouts detail the design and cost of the required electrical work for a customer’s service entrance. Please complete an electrical service request. New commercial services and upgrades for projects with an annual electricity demand over 50kW. New construction, rehabilitation and relocation of OH and UG Trunk infrastructure. Residential servicing of projects of five or more units/homes with a required amperage of 100, 200, 400 and 600 amps at 120/240V.